Thinking back, my thoughts tend to lean towards being critical, this should have been done better, that was a failure and so on. I have to remind myself to look at the positive as well. It was a busy year for us, but overall a good and happy 2017. So there is no positive in losing plants. Some just refuse to grow in Myrtle Glen. I know the first principle for a Florida-Friendly Yard is Right plant - right place. With some plants, such as my beloved elephant ears (Alocasias and Colocasias), I just keep trying to convince them that Myrtle Glen is the right place but all I can do to keep them alive is grow them in pots. We had to take down one of our pergolas due to wood rot. The positive, the porch seems larger without the structure and the Bougainvillea is still happy being supported by strong wires. We are completely happy with the newly added solar panels, our electric bill is no bill at all. Sadly, we took down the weather vane. The birds aren’t too happy about losing their look-out, but I am worried the vane could be lifted up to crash into a panel during a future hurricane. Looking back on this year’s blogging, I can't get the guts of it all to work correctly. Google Webmaster Tools for this domain is all messed up since I transferred the blog from WordPress to blogger and then once again to its own domain name. A total mess, it feels like wading through a waist-high swamp. 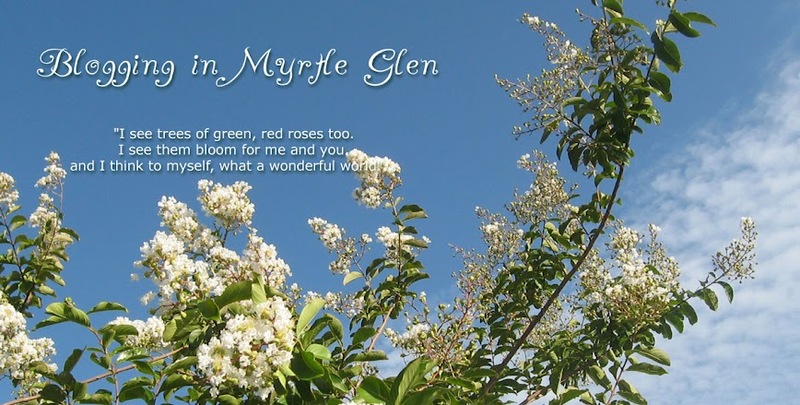 The positive, this blog is my journal for all that's going on in Myrtle Glen. I kept my pen on paper garden journals, but trying to find anything from years past is a pain. So much easier using the search field on the blog. I wanted to create a picture catalog of all my plants with names and useful information per plant. I gave up on the different photo gallery programs I tried out and ended up uploading the pictures to MyrtleGlenFL Pinterest boards instead. It is not the ideal solution, the pictures show up - or not. Why are some turned sideways? and of course, there is no way to change their order on the boards. But the Pinterest boards load fast, no limit on the number of pictures that can be uploaded, and it is free. Looking forward to a happy and hopefully exciting 2018. I also broke my analytics when I changed to the Soho template. But I get my most useful stats from StatCounter. And I record monthly stats for a long term trend. We have just bought an electric car and in an ideal world I would love to have photovoltaic panels to charge it. Maybe one day. Meanwhile we do have a solar geyser. How I wished I can pass you all the Alocasia and the Colocasias..
Its been fun with them but due to limited space in my garden - I decided to let them go. Looking at your beautiful garden - truly is a wonderful treat to see how beautiful you kept everything growing. All the best for this new year - may new joys of gardening fill you and brings you Joy.